Director Guillermo del Toro beautifully updates "The Creature from the Black Lagoon" in "The Shape of Water." Sally Hawkins plays a mute cleaning woman at a top secret government lab, where scientists have captured a half-human sea creature. They might send him into space, or perform an experiment on their unusual captive. Sally befriends and bonds with the creature, giving him sympathy following regular abuse from security chief Michael Shannon. With help from neighbor Richard Jenkins and co-worker Octavia Spencer, Sally plots the "asset's" rescue and freedom. 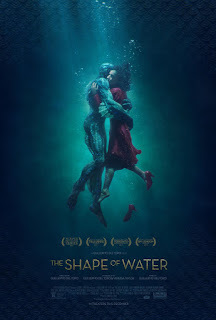 "The Shape of Water" includes visually outstanding fantasy sequences. It becomes a lyrical mixture of "Beauty and the Beast" and "The Creature from the Black Lagoon." "The Shape of Water," 3 stars, rated "R." Does it deliver what it promises? Strange, but beautiful. Is it entertaining? Unusual. Is it worth the price of admission? For the adventuresome.